The wide spectrum of joint disease in autoimmune disorders ranges from destructive/erosive processes affecting the synovium, cartilage, and bone, e.g., in rheumatoid arthritis (joint erosions), to ossifying changes with formation of new bone, e.g., in spondyloarthritis (syndesmophytes) or in osteoarthritis (osteophytes). Of note, both types of joint pathologies can be observed together in a certain disease, e.g., in psoriatic arthritis. These changes can be detected with good sensitivity and specificity by imaging studies including X-ray, ultrasound, magnetic resonance imaging, and computed tomography. On a molecular level, catabolic and anabolic molecular pathways are underlying the different patterns of joint disease (destructive, proliferative). 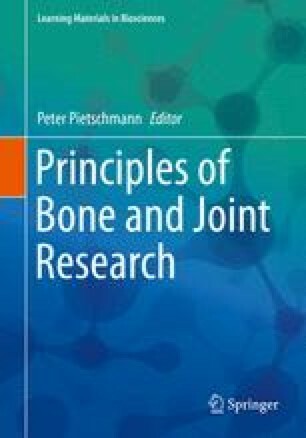 A dysfunction in joint remodeling results in an imbalance of degradation and formation of bone and cartilage. Whereas catabolic pathways such as those induced upon RANKL/RANK (receptor activator of nuclear factor κB (NF-κB) ligand), cathepsin K, and Dickkopf-1 (Dkk-1) engagement induce bone resorption and thereby erosive disease, anabolic pathways such as those involving bone morphogenic proteins (BMP) and wingless-type-like (Wnt) seem to favor new bone formation including osteophytes, syndesmophytes, and ankylosis. In addition, there are other pathways such as those mediated by hedgehog proteins that may have a dual function in arthritis, which are associated with catabolic or anabolic joint remodeling dependent on other factors. Future therapies might target these molecular pathways to specifically interfere with the imbalanced catabolic or anabolic joint remodeling in arthritis .